As mentioned, Moogest 2014 happens April 23 – 27 in Ashville, NC. 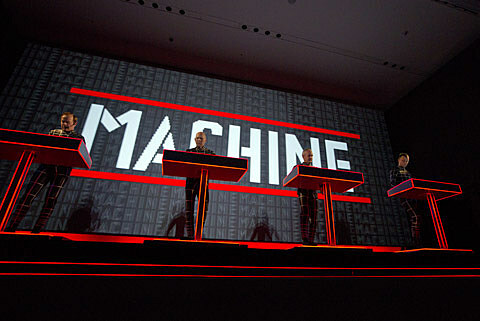 The festival has just announced its initial line-up which includes: Kraftwerk 3D (playing three concerts), Chic featuring Nile Rodgers, Giorgio Moroder, Laurie Anderson, Dan Deacon, Darkstar, Avey Tare’s Slasher Flicks, Adult, Le1f, Shigeto, Wolf Eyes, Les Sins (Chaz Bundick of Toro y Moi), and more. The full list of initial artists is below, with more than 70 more to be announced. There are showcases being put on by the likes of DFA, Fool’s Gold, Ghostly Intl, Warp and more. Laurie Anderson and Giorgio Moroder are also part of Moogfest’s previously announced daytime talks and seminars program, that also includes such artists as film composer Cliff Martinez (Drive), Emerson Lake & Palmer keyboardist Keith Emerson, Claire Evans from YACHT, and synthesizer innovators like Roger Linn and Tom Oberheim.